The Director and the Erasmus + Coordinator for Higher Education of the IES Puerto de la Cruz – Telesforo Bravo, Sergio Delgado Quintero and Carlos Manescau López, have attended last week to different events of the KA203 Erasmus+ project Talented Europe in Kosice, Republic of Slovakia. The host on this occasion was Technická univerzita v Košiciach (TUKE). On the 10th and 11th, the fifth Transnational Meeting took place at the Faculty of Civil Engineering. Meeting that served to mark the guidelines for the incorporation of new companies, academic institutions and students to the cross-plattform applications of Talented Europe. The report of the audit of monitoring and control by the SEPIE that we have passed as the coordinating center of this project was commented on. The impact of this project was reviewed and the sixth and final Transnational Meeting in Brussels was set for April as well as the associated Multiplier Event. In the library of Technická univerzita v Košiciach, the third Multiplier Event for this project was held on 12 October. This type of actions are aimed at presenting the target audience of the products generated (web and mobile applications). On this occasion, the Web application was presented to more than 80 people (among students, professors and companies). A Workshop on Android and iOS applications was also held for Talented Europe. Previously, our center had organized a multiplier event of these characteristics in the Tenerife Auditorium. This entry was posted in Talented Europe on October 16, 2017 by admin. During the days 2, 3 and 4 th November, was held in Luton -England-, the third Transnational Meeting of the Talented Europe Erasmus+ KA2 project. Moreover, it has been developed the first Multiplier Event of the project, used to disseminate the project among potential end users: students, educational institutions and businesses. The meetings have taken place at the University of Bedfordshire, one of the project partners, together with Belgium and Slovakia. From our center they have participated both teachers assigned to the project, Carlos Manescau and Sergio Delgado. The meeting was very fruitful and will be continued in the second half of the project (until September 2018) with three other transnational meetings. This entry was posted in Talented Europe, Uncategorized on November 7, 2016 by admin. During the 5th and 6th of May, the second Transnational Meeting of the Erasmus+ KA2 “Talented Europe” project was held in Brussels. This is a European project of our school, coordinated by CIFP César Manrique, and with partners in Belgium, Slovakia and England. The project lasts 3 years and its ultimate goal is the development of a computer application (both web and mobile) to put talented students in contact with companies. Our center has been attended by the two teachers at the school involved in the project: Carlos Manescau and Sergio Delgado. This entry was posted in Talented Europe, Uncategorized on May 10, 2016 by admin. These meetings have been attended by the coordinator of Erasmus+ for Higher Education and head of the department of Innovation and Quality CIFP César Manrique, Héctor Barrios Barrera, coordinator Erasmus + Vocational Training, Eduardo del Reguero, with the director of European Projects Association, Dino Babic and his collaborator Frederic Fabre, and representatives of the universities of Bedfordshire, Neville Hunt and Yan Qing Duan, and the Technical University Kosice, Martina Pluchtova. 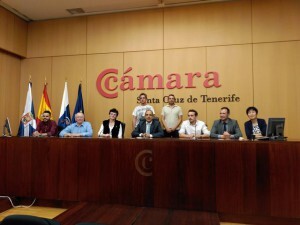 As well as the project partners in Tenerife, the coordinator Erasmus+ for Higher Education, Carlos Manescau López, and the director, Sergio Delgado Quintero, IES Puerto de la Cruz – Telesforo Bravo. This entry was posted in Talented Europe, Uncategorized on December 4, 2015 by admin. This entry was posted in Talented Europe, Uncategorized on September 7, 2015 by admin. Talented Europe Erasmus+ KA2 Project is ongoing! CIFP César Manrique and IES Puerto de la Cruz – Telesforo Bravo application for the Erasmus+ KA2 Strategic Partnership “Talented Europe” project has been awarded by the SEPIE (Erasmus+ National Agency in Spain) as one of the 15 selected projects in Spain for Higher Education. This is the new K2 Strategic Partnership project in which development has participated IES Puerto de la Cruz – Telesforo Bravo. The project, under the Erasmus+ Programme, has been coordinated and applied by CIFP César Manrique in 2015 call for proposals. Teachers from the IT Department of our two institutions have hardly worked, with the cooperation of our three european partners, in the design, development and presentation of an idea we firmly believe. This entry was posted in Talented Europe, Uncategorized on September 3, 2015 by admin.